Comic Art Friday: Happy birthday, Supergirl! Twenty-two years ago today, The Daughter entered my world, and changed it forever. I’ve called her Supergirl for years, because she often used to wear a pink hoodie with the Kryptonian shield emblazoned on the chest. Truth to tell, though, she’s really more of a Mary Marvel — like Mary, she’s a brunette, and also like Mary, she retains her youthful innocence and charm even when she transforms into a superheroine. I hope you have a spectacularly wonderful birthday, Supergirl. You’ve earned it this year. And I hope and pray that you enjoy many, many more birthdays to come. I love you as much as a father can. You know that old saying, “Clothes make the man”? Shouldn’t that be, “Clothes make the woman”? Women — to generalize to the point of stereotype — tend to be more selective about their clothes than men are. The furor mostly ignored the fact that DC has tinkered with Diana’s fighting togs on several occasions. For several years in the late ’60s and early ’70s, she didn’t even wear a costume. In the main, however, the platform of Wonder Woman’s gear has followed a pattern — the tiara, the bustier, the star-spangled lower half, red footwear. 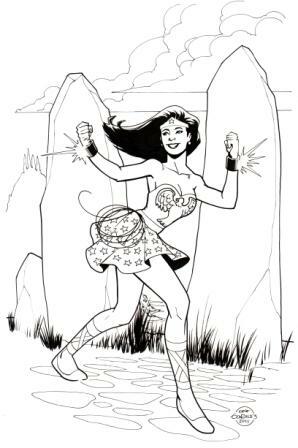 If I were designing Wonder Woman’s ideal outfit, it would look the way Gene Gonzales draws it in today’s featured artwork. I’m partial to the old-school bustier with the golden eagle emblazoned on the front. It seems a more realistic reflection of Diana’s connection to ancient Greek mythology than the stylized version of the past several decades, in which the eagle has been transmogrified into a modern “WW” logo. No one in the comics world ever seeks my opinion about anything. But if they did, I’d tell them that this ought to be Wonder Woman’s standard costume, forever and ever. I may not know much about fashion, but I know what I like. Why this song is an adrenaline rush: If there was ever any doubt that Joe Walsh is one of the most spectacularly gifted guitarists in the history of rock, the opening riff of “Life in the Fast Lane” should dispel said doubt. And if there was ever any doubt that Walsh playing alongside Don “Fingers” Felder was one of the most potent two-guitarist combinations in the history of rock, the dueling break at the bridge of “Life in the Fast Lane” should kill that, too. Plus, the lyrics are classic L.A. cool. “Life in the Fast Lane” represented one of Joe Walsh’s first musical contributions to The Eagles, which he joined shortly before the band recorded Hotel California, the album on which the song appears. According to legend, Walsh improvised his signature guitar part during an Eagles rehearsal, and his new bandmates Glenn Frey and Don Henley wrote the rest of the song around the riff. Walsh replaced founding Eagle Bernie Leadon, who left the band in dissatisfaction with Henley and Frey’s changing musical direction, which gradually deemphasized Leadon’s preferred country/bluegrass-flavored style in favor of harder-edged rock. Leadon announced his departure from the band by pouring a beer over Glenn Frey’s head. There used to be a roller coaster named “Life in the Fast Lane” at the short-lived Hard Rock amusement park in Myrtle Beach, South Carolina. My friend Donna loves The Eagles more than life itself. She just wanted you to know that. I’ll be honest — sometimes, the only reason for a new Common Elements commission is that the idea made me grin from ear to ear when I thought of it. Well, not literally from ear to ear in that Julia Roberts / Cameron Diaz sort of way. My mouth is not that enormous. More like from mid-cheek to mid-cheek. Comics veteran Mike DeCarlo, who has drawn and/or inked everything from Spider-Man to The Simpsons during his quarter-century-plus in the industry, teams Sabrina, the Teenage Witch — star of comics, animation, and live-action TV, and responsible for extending the acting career of Melissa Joan Hart well beyond her teens (and, some might opine, beyond the limits of her talent) — with Caitlin Fairchild, leader of the youthful superhero team Gen13, who’s often known simply by her surname. Okay, you’re thinking — that explains Sabrina. But what’s the Fairchild connection? If you’ve seen the movie, you know: the character Sabrina’s last name is Fairchild. That makes me smile. Doesn’t it you?